Anybody who has ever considered buying an RV has been faced with this question: do I need a regular travel trailer or a 5th wheel trailer? They both have similar strengths, as well as some contrasting flaws or limitations. What are the 5th wheel vs travel trailer pros and cons? The choice of a recreational vehicle is entirely dependant on the circumstances of the aspiring RVer. You should make a decision based on your needs, capabilities, and budget. All we can do is give you a clear idea about these two types of trailers: their strengths, weaknesses, peculiarities, who they might be suitable for, and who should probably steer clear of them. This is going to be an in-depth guide, with a strong emphasis on helping out rank beginners to the world of RVing. If you are somebody who can identify a single 5th wheel out of a lineup of 10 travel trailers, you might want to skip the next section or two! With that caveat out of the way, here is our guide to 5th wheel trailers and travel trailers. As you might have already guessed from their names, both the vehicles in the spotlight here are a species of trailers, a.k.a, towable vehicles. They are both RVs, with beds, living spaces, bathrooms, kitchen spaces, and other amenities and luxuries inside. Their basic purpose is pretty straightforward: you stock them with supplies, attach (or hitch, to be precise) them to your car, SUV, or truck, and take them along on road trips. These trailers allow you to have a nomadic and leisure lifestyle. You get your necessary home comforts even when you are on the road. Both 5th wheel and travel trailers are often a cheaper alternative to the pinnacle of RVing lifestyle: the drivable motorhomes. The latter are literally buses kitted out living spaces behind the driver’s cabin. Let’s take a look at the main differences between 5th wheel and travel trailers based on the different features, abilities, and limitations. ​Travel trailers come in different sizes, but they all have a typical shape that can be easily distinguished from a 5th wheel trailer. The front portion of a travel trailer has the same size and shape as the rear part. 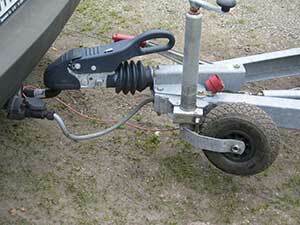 ​But 5th wheel trailers have a different front end design that is easily identifiable. The front portion has a raised shape, which is designed to sit snugly onto the bed of a pickup truck. In plain words, the front section of a 5th wheel trailers looks as if the bottom half has been sliced away! 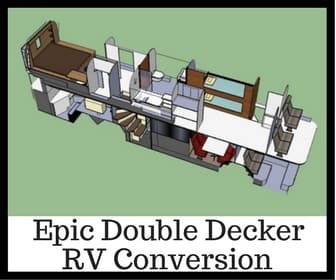 ​This is the main feature that distinguishes a travel trailer from a 5th wheel. Both these trailers use different types of the coupling mechanism. The choice of coupling radically affects all aspects of the trailer: its size, on-road performance, suitability of specific towing vehicles, all are affected. ​A travel trailer uses a conventional horizontal coupling with a ball and chain. It can be hitched to the back of a wide variety of vehicles, including regular cars and SUVs. You can attach a travel trailer to any road vehicle that has a proper trailer hitch receiver connected to its chassis at the rear. A 5th wheel trailer uses an altogether different type of coupling. It has a mostly vertical design and is called the 5th wheel coupling. The receiver for this type of hitch has to be installed directly onto the bed of a pickup truck, and not on to the rear end of the vehicle chassis. Due to the different hitching mechanisms, both these RV types have several fundamental differences which we will examine in detail in the following sections. Travel trailers have an edge here as far as versatility is concerned. They are compatible with the widest range of vehicles. This is because the travel trailer coupling receiver can be attached to the rear chassis of most four-wheeled road vehicles out there. If a travel trailer is connected to a pickup truck, the bed of the pickup truck is still available for use for hauling extra stuff. A fifth wheel is at a severe disadvantage in this aspect. Due to the restrictions of the 5th wheel coupling design, it can only be attached to a pickup truck. The receiver for the 5th wheel coupling has to be attached to the truck bed, and not the rear of the vehicle. And the front portion of the trailer will sit above the truck bed, leaving you no space to use on that part of the truck. In general, travel trailers are smaller than 5th wheel trailers. They also tend to be lightweight, with lower roofs. This makes them more fuel efficient since you don't need a large pickup truck to tow them around. Thanks to the low ceilings, they provide more overhead clearance as well. But since they attach to the rear end of a car, the combined length of the towed system will be longer. As you necessarily need a larger vehicle like a pickup truck, a fifth wheel trailer can afford to be larger and heavier as well. You will face more frequent clearance difficulties while on the road in a 5th wheel, as the roof of these trailers is often set higher. But since they sit on the truck bed, the overall length of the towed system is often lesser in comparison to a travel trailer. If you are towing a travel trailer with a car or SUV, you can have more folks sitting in the rear passenger seat. But with a 5th wheel trailer, you are forced to drive a pickup truck. This naturally means that if you are RVing as a family, you cannot have everyone traveling together in the towing vehicle. This is one area where a 5th wheel trailer entirely outclasses a travel trailer. In travel trailers, there is a very pronounced swaying of the towed vehicle due to the way it is hitched to your car. This can make driving, especially taking corners hair-raising. Modern devices like the Hensley Hitch and PullRite can mitigate this sway somewhat, but it cannot be removed entirely. Jackknifing is a significant concern with travel trailers. This is a situation where the towed vehicle swings around and collides with the towing car. This usually occurs when the towing car or SUV skids on the road. The hitching mechanism in a 5th wheel trailer offers more stability. The vehicle is securely attached to the towing pickup, anchored to the bed. So there is much less sway and way less potential for jackknifing accidents. As already mentioned, 5th wheel trailers tend to be bigger and taller than travel trailers on average. You will often find more storage space on 5th wheel trailers. Due to the taller setup, 5th wheels often have multiple levels when it comes to indoor living space. In comparison, travel trailers are more cramped, with a flatter floor arrangement. If you want more headroom as a tall person, a fifth wheel is often the better choice. Thanks to the multi-level design, fifth wheels usually have dedicated storage areas in the undercarriage area. Due to the larger space on offer, 5th wheels can haul more luxuries and amenities than a travel trailer. But the multi-level floor plans can be challenging for folks with reduced mobility. So if you have seniors traveling in the RV, then some 5th floors may be unsuitable. As a general rule, the smaller trailers will have an easier time finding adequate spots on a campsite. If you plan to go boondocking, i.e., roughing it out in the wilderness, a travel trailer might be easier to live with. They can fit into cramped zones much easier than a more massive 5th wheel trailer. As far as backing up and parking are concerned, we cannot really consider one to be easier than the other. Regardless of the trailer design, RV parking is all about experience and practice. That being said, if you have experience with a travel trailer, parking the 5th wheel will feel hard and unfamiliar, and vice versa. Let’s just say that both are equally hard/easy, in their own ways. The larger 5th wheels tend to be more expensive than regular travel trailers. The price difference could be anywhere from a few grand to over 10k. But you do get a fair bit of value from a 5th wheel, despite the extra cost. If you want luxury on a budget, a 5th wheel is a fantastic budget option, with features that can compete with high-end motorhomes. Travel trailers are cheaper and have less running costs as well. These lighter vehicles incur fewer fuel costs and are easier to maintain as well. Thanks to the more complex design, 5th wheels have more moving parts that can increase the overall maintenance costs quite a bit. The above breakdown of features should have given you a fair idea of what to expect from these trailers. Now let's try to describe the ideal user for each of these RVs. That just about covers everything that needs to be said about the pros and cons of travel trailers and fifth wheel trailers. Both are fantastic options to consider for RV trips. You could have fantastic RV trips in either type of vehicle. Based on the above checklist, you can eventually figure out the best option for your RV trip. Good luck, and have fun RVing! Ever considered converting a box van into﻿ ﻿﻿an﻿ ﻿RV﻿?